Cast Your Vote for the Big Idea! 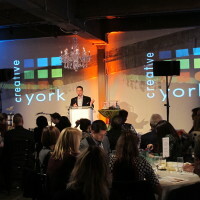 The awards promote the innovative spirit of the thriving Creative York community. Ticket proceeds benefit Creative York’s arts education and creative programs for kids and adults in York County. ADMISSION: $75/person. Purchase online or call 717-848-3200 by October 15. Each ticket includes dinner, dessert, and two drinks on the house.